In general, when one co-owner of real property held as joint tenants with right of survivorship dies, the living co-tenant gains the property rights of the deceased owner by function of law. As long as the remaining owner survives the deceased owner by at least 120 hours, the asset is not affected by the owner's will, and therefore does not pass through the estate and is not subject to probate distribution ( 112.582(5)). Even though the transfer is supposed to be automatic, the Oregon statutes contain instructions for establishing death under the survivorship rules codified at ORS 112.570 to 112.590. Primarily, to prove that the deceased owner has actually died, the living co-owner should obtain "a certified or authenticated copy of a death certificate purporting to be issued by an official or agency of the place where the death is alleged to have occurred" ( 112.582(2)(a)). Once the survivor has the death certificate, he/she should submit it for recording, along with an affidavit of surviving joint tenant, to the same office that recorded the deed granting the survivorship tenancy to the co-owners. An affidavit is a document containing statements made under oath, and is admissible as evidence. The affidavit is not explicitly required by Oregon law, but it helps to protect the survivor's interest in the real property by clarifying and formalizing the change. In addition, the affidavit includes details about the specific parcel(s) of land and recording information from the original deed. 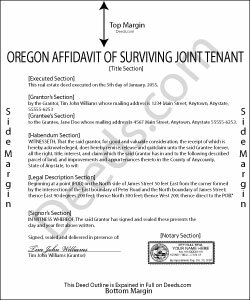 Recording the affidavit of surviving joint tenant and official death certificate provides public notice of the change in ownership, which in turn maintains the chain of title (sequential list of owners). A clear chain of title, with no gaps, reversals, or other details out of order, makes it easier to acquire title insurance, which should simplify future sales or mortgages of the property. Joyce D. said: Good after I figured out the form process. Hopefully I won't be charged for two as I redid the request thinking I might have made a mistake in the first request. Reply from Staff: Thank you for your feedback Joyce. We have reviewed your account and there have been no duplicate orders submitted. Have a great day! Brooksye G. said: Very helpful. I live in Arkansas and needed information and documents for a Missouri transaction. I got everything I needed without any hassle. Reply from Staff: Thank you Brooksye, we really appreciate your feedback. Edward L. said: Excellent web site with just the right documents. Filled a very important need in less tha 2 minutes time.